Equalization with Doc’s Proplugs: Doc’s Proplugs have also been used by divers who have trouble equalizing. Unlike other earplugs which are solid and would not be recommended for diving, Proplugs are vented to allow equalization. While the small vent allows equalization to occur it does not allow debris to enter and it prevents earwax from washing out which exposes delicate ear tissue. The Proplugs keep ears warm by storing the head’s conductive heat; the warmth provided by the plugs drastically reduces the risk of thermal shock. Due to surface tension the vented plug also reduces abrupt pressure changes from reaching the sensitive eardrum which contributes to easier equalization. 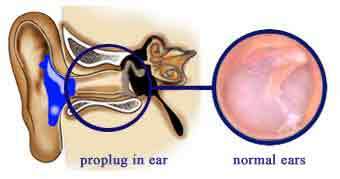 Clear ears often to allow air to escape through the Proplugs vent and allow for better equalization. Proplug wearers who have trouble clearing their ears should check to make sure a lump of ear wax is not blocking the canal or butting up against the vent. If the vent is fouled by debris while descending it is best to remove the Proplug. If fouled while ascending, there is no problem because the air and water under pressure can escape around the Proplug.Hundreds of thousands of divers have attested to the benefits of Proplugs for relieving pressure in their ear during descent.